A traffic stop turned into a “crazy incident” for a Walton County, Georgia, deputy on Sunday, March 18, as the suspect started to wrestle with him. From that point on the situation kept escalating, leading to a car chase, an injury, property damage, and an arrest, thanks to help from a concerned citizen. 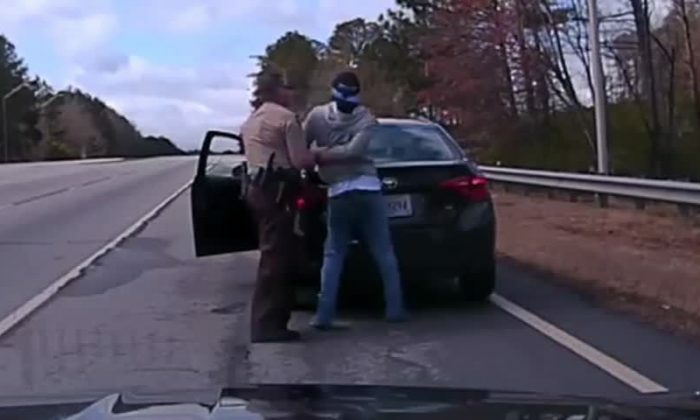 The Walton County Sheriff’s Office said that the suspect was stopped for driving 78 mph in a 55 mph zone, according to its Facebook post. From the footage, it appears the deputy was about to handcuff the suspect when the two started to wrestle and fall to the ground. The suspect slipped out and before the deputy could catch him again, he jumped into the car and drove off, knocking the deputy to the ground. A person in a white truck noticed the incident, turned around, and started to follow the suspect’s car. Police caught up with the suspect and a high-speed chase ensued. Several law enforcement cars were damaged before the suspect’s car was forced off the road, finally getting the driver to stop. The suspect was arrested and charged with multiple counts, including aggravated assault on a law enforcement officer and several drug charges as he possessed a large amount of Zanax, police said. The sheriff’s office didn’t identify the suspect. They didn’t identify the person who helped them either.